In October 2010, Microsoft re-branded the XNA Creators Club website to the App Hub. The new website continues to support Xbox LIVE Indie Games as before, but now includes support for Windows Phone development. All existing XNA Creators Club memberships have been migrated to App Hub annual subscriptions: they function as before however, independent game developers can now submit "apps", that is, apps and games to the App Hub for sale or free download in the Windows Phone Marketplace. Therefore, the focus from Microsoft is now clearly on the Windows Phone. Subscribers new to the App Hub will need to register an account to verify email address. Existing XNA Creators Club members can simply verify email address from the My Apps page. Developers require a process to authenticate their identity. Identification validation is the process to ensure developers within the Windows Phone Marketplace are authentic. This protects from someone assuming their identity while also maintaining end-user trust. Important: identity validation must be complete before developers can unlock Windows Phone devices, deploy apps to the phone, and submit to the App Hub for certification testing. Microsoft partners with GeoTrust whom provide identity verification services. On Microsoft's behalf, GeoTrust will contact the developer during the identity validation process. Developers outside the U.S. are required to complete a GeoTrust form that includes a copy of government issued photo identification and the developer's signature. Once identity is confirmed, GeoTrust will issue a unique digital certificate; the App Hub uses the digital certificate to sign all applications published by the developer. New subscribers to the App Hub should experience smooth transition here: after verifying email address, GeoTrust will contact the developer and begin the Publisher Identity Verification process. This message is misleading and incorrect: as existing XNA Creators Club memberships are migrated to App Hub subscriptions, no new details are sent to GeoTrust. Therefore, GeoTrust has no knowledge of existing members, thus no contact is made. Meanwhile, the developer will wait indefinitely for GeoTrust to contact them, as per the App Hub message! This will ensure that the dummy app is not published! Submitting a dummy app should initiate contact from GeoTrust. From there, GeoTrust will request documentation from the developer, as required, in order to complete Publisher Identity Verification. Enter Windows Live ID, password and click "Register"
Status: Your phone has successfully been registered. Apps can now be deployed to Windows Phone. to ensure payment is made from the sales of apps on Windows Phone Marketplace. New subscribers to the App Hub must submit the relevant Form W-8 tax form to Microsoft. Pls read this post for more information. 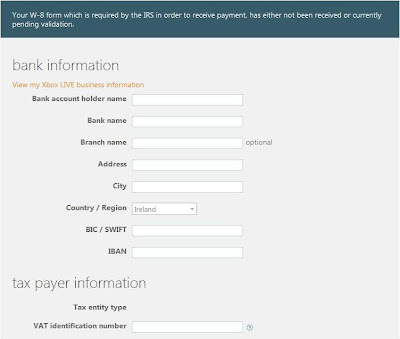 "W8 Form processed. Ready to be paid." I have confirmed with internal authorities that the commerce mechanisms are now integrated. You only need to set up the W8 once for your account, and then it will work for all the technologies supported in the App Hub. Fortunately, Microsoft has acknowledged this issue and confirmed a fix in the next update release. 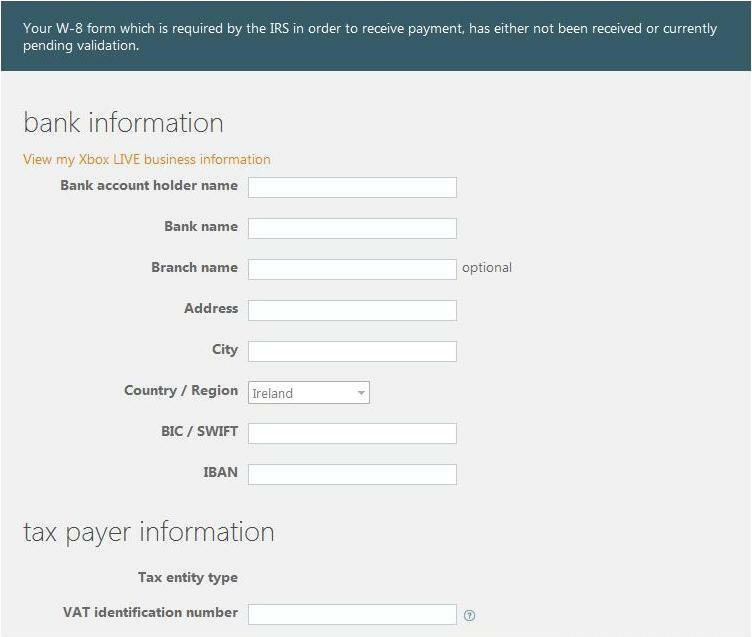 Note: to be correct, some developers have reported the ability to hack bogus VAT identification number in order to successfully save their bank and tax information, although this does not seem appropriate. On a brighter note, there are encouraging signs for games on Windows Phone and paid games are a hit on the device: games occupy the Top 10 slots in the Windows Phone Marketplace; good news for independent game developers whom wish to publish on both Windows Phone and Xbox platforms. Hopefully the App Hub experience will also improve once these issues have been resolved.